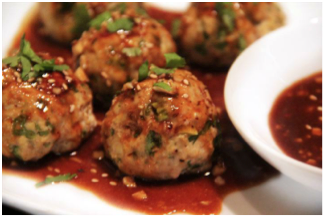 While you may not think of meatballs and Asian cuisine together as one, the time-tested meatball gets a fresh spin from ginger, garlic, and soy sauce. Using turkey instead of red meat reduces the fat and cholesterol, which have been linked to cardiovascular disease. Serve with brown rice and vegetables for a meal or stick with toothpicks for appetizers. Combine all ingredients except water in a large bowl. Roll 16-20 walnut sized balls and place them in a microwavable container. Pour enough water to cover the bottom of the container by ¼”. Microwave on high for 3 minutes. Turn meatballs over and continue to microwave on high for 1 minute intervals until meatballs are cooked through, no longer pink on the inside or have reached 160 F on a thermometer. Combine all ingredients for sauce and serve with turkey meatballs.